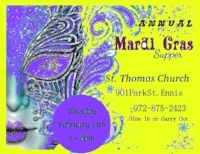 Annually we have a Mardi Gras Supper on Fat Tuesday, from 5pm to 8pm. Please remember to join us in 2019 for gumbo, rice, beans, bread pudding and great fellowship. Dine in or Carry out is always available. Check back here throughout the year for our events.